Now you can judge taekwondo poomsae with confidence. All judging features have been extensively tested under competition conditions for clarity and ease of use to promote confidence in the scoring process. Designed to support the latest World Taekwondo Federation poomsae rules, TechScore has been developed by experienced poomsae judges and used to score club, state, Australian and international events. 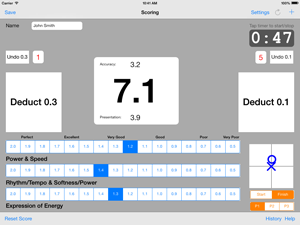 Save up to 10 scores locally on your iPad or use a local TechScore scoring server (available separately) to combine and display scores in real time and manage the progress of your event. The Save button is used to save the score to either the server if in competition mode or to the history table if in club mode. Tapping the History button will show the table of scores saved while in club mode. Tapping the reset button will initialise the scoring screen back to its default settings. Tapping the refresh button will update your competitor information from the scoring server. This button is only available in competition mode. Tapping the settings button will show the settings popup which allows you to set which mode to score in and setup competition mode. Used to time poomsae. Tap once to start, tap once to stop, and double tap to reset. Use the player text field to save an athletes name with their score while in club mode. When in competition mode the text field will be replaced with information loaded from the scoring server. Allows you to record the start/finish positions of up to 3 athletes. Use the selectors below to select what you want to set then tap anywhere inside the white grid to set the position. If you want to change the position you have set then tap somewhere else. This selector allows you to set which player you're recording a start/finish position for. Player 1 is blue, Player 2 is red and Player 3 is black. 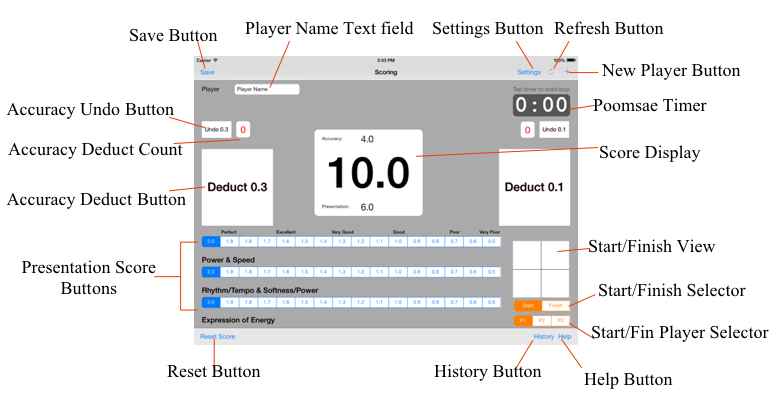 The deduct buttons are used to record accuracy deductions. The undo button will remove a deduction and the deduct count shows how many deductions have been recorded. Presentation score radio buttons are used to record the score for each of the three presentation components. The text below the buttons shows what each one is for. The Score Display shows the current score in large text in the centre and the accuracy and presentation scores in small text above and below. TechScore allows you to save up to 10 scores in the app and reload them to the scoring screen at a later time. To view the scores that have been saved tap the History button on the bottom right. While in the Score History screen it is possible to delete all saved scores using the "clear" button in the top right, or to delete a single score by swiping sideways on the row. To reload a saved score from the history, tap on the score that you want to reload. 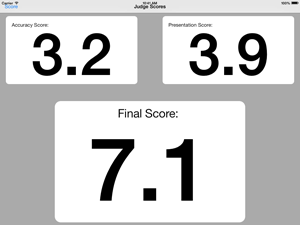 TechScore is able to connect to a compatible website to run competition scoring for multiple judges. There are three different methods that can be used to connect to the server, they all require the following five steps to be completed first. When using this method your court co-ordinator will start the connection timer on the TechScore website, once the timer has been started simply tap the "Register" button at the top of the screen.